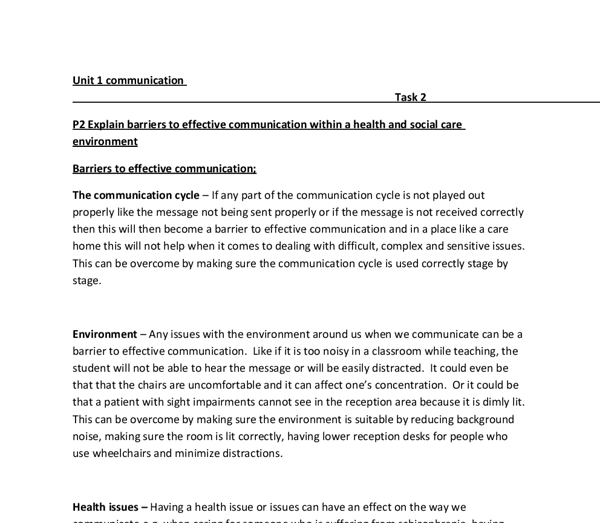 ﻿Unit 1 communication Task 2 P2 Explain barriers to effective communication within a health and social care environment Barriers to effective communication; The communication cycle ? If any part of the communication cycle is not played out properly like the message not being sent properly or if the message is not received correctly then this will then become a barrier to effective communication and in a place like a care home this will not help when it comes to dealing with difficult, complex and sensitive issues. This can be overcome by making sure the communication cycle is used correctly stage by stage. Environment ? Any issues with the environment around us when we communicate can be a barrier to effective communication. Like if it is too noisy in a classroom while teaching, the student will not be able to hear the message or will be easily distracted. It could even be that that the chairs are uncomfortable and it can affect one?s concentration. Or it could be that a patient with sight impairments cannot see in the reception area because it is dimly lit. ...read more. Having the correct knowledge of different cultures could overcome this sometimes but in many case it?s almost inevitable to completely overcome it. Language ? This can become a barrier when someone communicates in a certain language or even sign language and there is no one with the same knowledge of that language who can understand. Accents ? Certain accent can be very difficult to understand for e.g. People from Pakistan pronounce v?s as w?s and w?s as v?s e.g. they would say ?vindow? instead of ?window? and ?vhat? instead of ?what?. In a place like a hospital or doctors surgery you may be faced with these problems making it hard to fully understand a patient which will result in not being able to fully meet their needs. This can be overcome by having someone there to interpret or someone to sign when not having the same language or when having difficulty understanding accents. Or if someone uses jargon ? technical language e.g. ICU stands for intensive care unit in the healthcare profession. Using Slang ? informal language like LOL laughing out loud, others may not understand. ...read more. Emotional difficulties ? Our feelings or how we are coping can become a barrier to effective communication e.g. Some times when someone is angry while in an argument they block out other people and what they are trying to communicate or while driving mad they may ignore the red lights and signs. When people receive bad news they may become irrational thus becoming hard to communicate to. Another example would be when a sonographer during a scan for a pregnant woman, cannot find the babies heart beat it would be better not to say anything until it is confirmed by a doctor because saying something prior to confirmation might cause the pregnant women emotional stress causing her to become irrational and ignore that there actually maybe nothing wrong at all with her baby. Emotional difficulties is a common challenge that most healthcare professionals deal with in places like hospitals or in care homes. Distress ? When someone is distressed they don?t usually listen properly and then misinterpret what is said or they may find it difficult to communicate especially when they become tearful which is another common problem healthcare professionals are faced with. They both can be overcome by giving the person time to calm down or being sympathetic towards them. ...read more. Overall a very good attempt at this task. 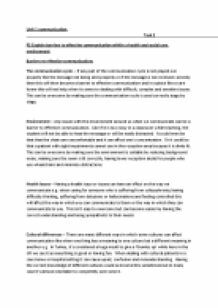 Various barriers to good communication are identified and appropriate examples are given in relation to H&SC settings. Just be mindful to use appropriate terminology throughout and check again for odd grammar errors. If an individual does not feel safe, they undermine their self- image and self- esteem. Assessing Care Needs The NHS and Community Care Act 1990 have meant that all people in the UK are entitled to assessment of their care needs by social workers and other professionals. be given clear guidelines and procedures on how to control these substances; * The employees should wear white plastic apron and gloves when handling the patient especially after handling bodily waste to prevent infections. * Equipments like bathtubs, toilets, tables, chairs and floors should be clean all the time by disinfectant products such as dettol. Mental health care service consists of services such as counseling, psychological therapies, community and family support, and general health screenings. For example, people experiencing bereavement, depression, stress or anxiety can get help from primary care or informal community support. If they need more involved support they can be referred for specialist care. If a care worker was to ignore the clients needs, fears or wishes or if the client struggled to talk the same language as the care worker and was ignored because the care worker didn't bother attempting to communicate with the client this care value wouldn't be followed. personal care steps on a regular basis this can cause them to form infections but carers at a residential home can make sure that they do this so infection can be prevented. Aids for living ? Aids for living can assist somebody to live at home independently. Argyle's and Tuckman's Theories of Communication. The third part of Tuckmans theory is norming so when the group have finished storming they start to move onto norming which is when everything becomes normal and the group gets used to each other and decide to start communicating without difficulties and without any kinds of problems.